It is reported that the Public Interest Rights Activist, Nagananda Kodituwaku has demanded CIABOC to tender an unqualified apology to the Chief Justice for deceiving the Supreme Court by making a manifestly falsified submission to the Court that the CIABO has already commenced a credible investigation into the activist’s complaint made in August 2016 on MP permit abuse. When the matter was taken up for support on 15th June 2017, activist asserted that the that the undertaking given to Court by the CIBOC was a diabolical lie uttered to deceive the Supreme Court and the people with serious accusation leveled against the CIABOC that it simply cannot carryout its functions as required by law in cases where the Executive President, the Cabinet of Ministers and the MPs are involved. In the written notice served on CIABOC dated 21st June 2017, the activist Nagananda says that the said undertaking given to the Supreme Court by the CIABOC is simply another ploy to suppress this day light robbery of public funds involving the corrupt MPs and the Cabinet of Ministers. 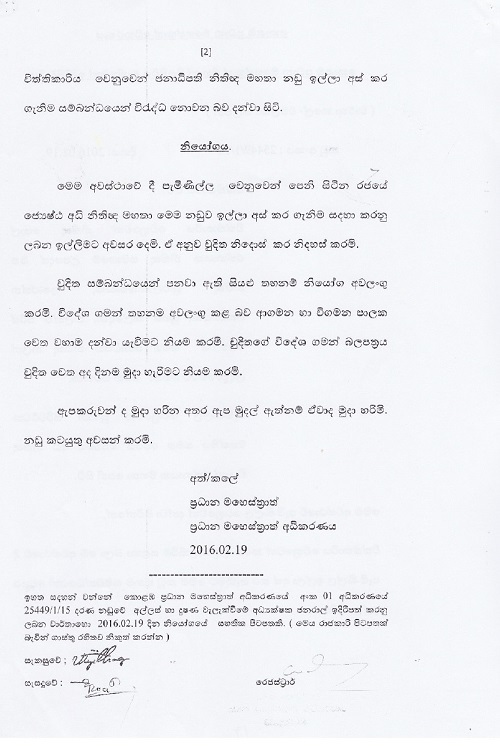 In the activist’s hard-hitting letter addressed to the Chairman of the CIABOC on 21st June 2017 the activist says that the undertaking given to Court by the CIABOC that it has already commenced a credible investigation was manifestly false and that the former Director General Dilrukshi Dias Wickramasinghe had earlier at a press briefing had threatened and intimidated the activist with a criminal prosecution under Section 21 of the CIABOC Act for making a false allegation. 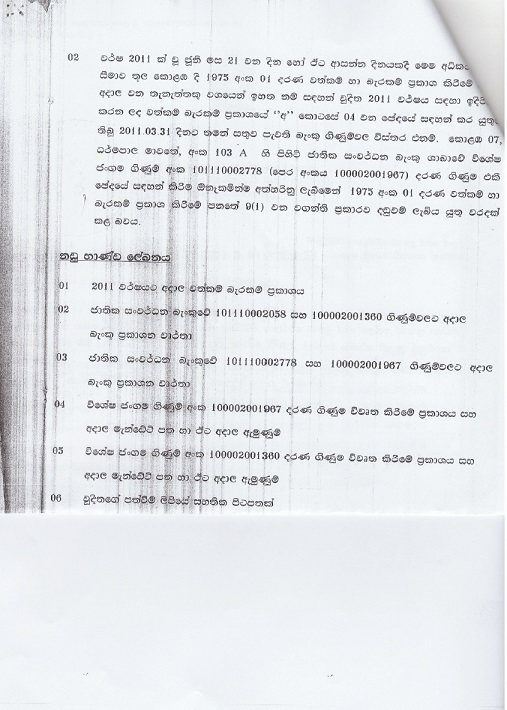 In the submission made to the Court the activist submitted to the Court that since the CIABOC fatally failed to act as required by law on activist’s complaint, private companies and individuals who are prohibited to enjoy this tax exemption had imported over 100 Land Cruiser Jeeps on these MP tax-free permits. The Supreme Court also heard with attention drawn to the relevant documentary evidence that the total failure of the CIABOC has opened the floodgates for corrupt MPs and Ministers to abuse the MP tax-free permits with no respect or regard to the Rule of Law. And even the Executive President M Sirisena, has taken the advantage and imported a Land Cruiser Jeep on 14th Oct 2016 claiming himself to be an MP for Polonnaruwa District and the former President, Mahinda Rajapakse, (now a Kurunegala District MP) too has imported a similar vehicle on 19th Sep 2016 on a MP tax-free permit, defrauding the payment of fiscal levies of Rs 33,457,500.00 for each vehicle. In this backdrop the activist Nagananda claimes that this totally deplorable conduct on the part of the CIABOC has patently proved that although on paper it is an independent body created by law to combat bribery and Corruption, in practice it is completely an impotent statutory body that does not enjoy any independence at all, particularly when it comes to matters involving corrupt MPs, Ministers and the Executive President. Setting out examples of the dismal failure of the CIABOC and reason for not to accept its undertaking to conduct a credible investigation, the activist submitted to the Court that when President Mahinda Rajapakse was determined to remove the Chief Justice Shirani Bandaranayake, he used the CIABOC as a tool. 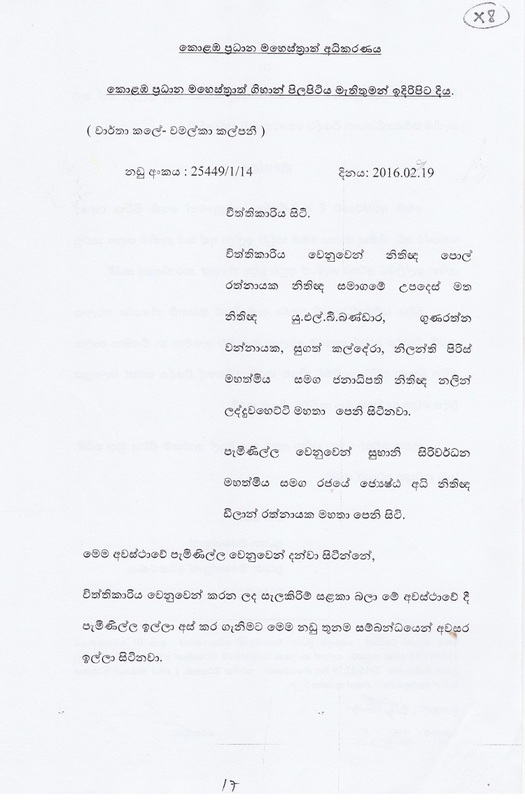 On 26th of July 2013, the then Director General of CIABOC Luckshme Jayawickrama, brought three charges before the Chief Magistrate Court, Colombo (copies enclosed) against the Chief Justice on which the Chief Justice was unjustly impeached. Once the duty entrusted on the CIABOC was duly accomplished, the Attorney General later made an application to the Court on behalf of the CIABOC, seeking permission to withdraw all the charges. And the Court exonerated the Chief Justice from all the unsubstantiated criminal charges leveled against her. In the demand sent to the CIABOC the activist claims that CIABOC was created by law for a purpose; that is to combat bribery and corruption against any person who violates the law, guaranteeing the Commissioners total independence to perform the public office for ‘public good’ with due respect and regard to the public trust doctrine without violating the integrity and the public confidence placed in it. However, the conduct of the extant Commissioners and the Director General of the CIABOC has proved, beyond any doubt, about their inability to deal with high profile major fraud inquiries. And that the CIABOC has fatally failed to realize the expectations of people and blatantly violated the people’s trust placed in the CIABOC. 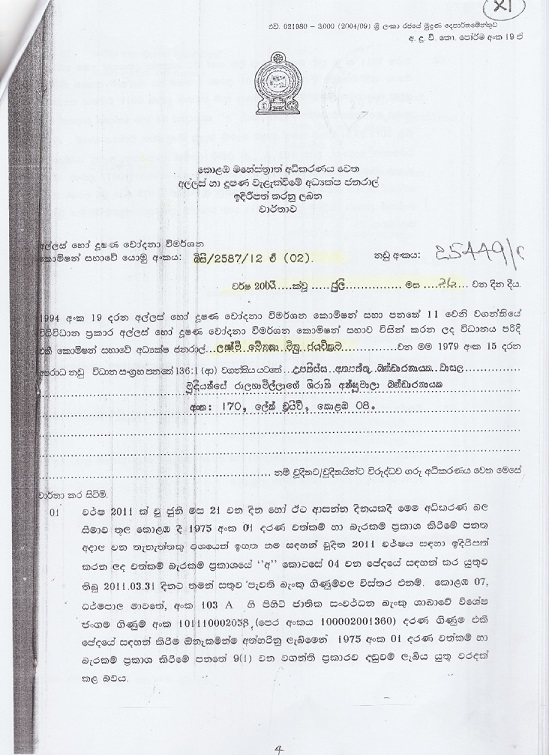 The notice served on the CIABOC by the activist Lawyer Nagananda has also been served on the Office of the United Nations High Commissioner for Human Rights, Switzerland and also on the Commonwealth Secretariat, London, since they have already expressed their concerns about the state of administration of justice in Sri Lanka. The government has already conceded these serious charges and has co-sponsored a resolution passed against the government of Sri Lanka by the UN Human Rights Council, which dictates that the people have no confidence in the Judiciary, which lack accountability. This entry was posted on Friday, June 23rd, 2017. You can follow any responses to this entry through the RSS 2.0 feed. You can skip to the end and leave a response.